Samsung launched Galaxy Apps for its devices back in September 2009. And now, after more than nine years, the company has rebranded it to Galaxy Store. That's the company's official app store that distributes apps, themes and customizations, and even watch faces for Samsung smartwatches. And, Samsung has not only given Galaxy Apps a new name but a new look as well. The app has been redesigned to align better with its new One UI - a design language we have seen on Samsung smartphones like Galaxy S8, S9, S9+, Note8, and Note9 running Android Pie. The new UI should make it easier for you to navigate through the app as you now have a bar at the bottom that offers quick access to four different sections of the app - Apps, Game, My Galaxy, and Watch. 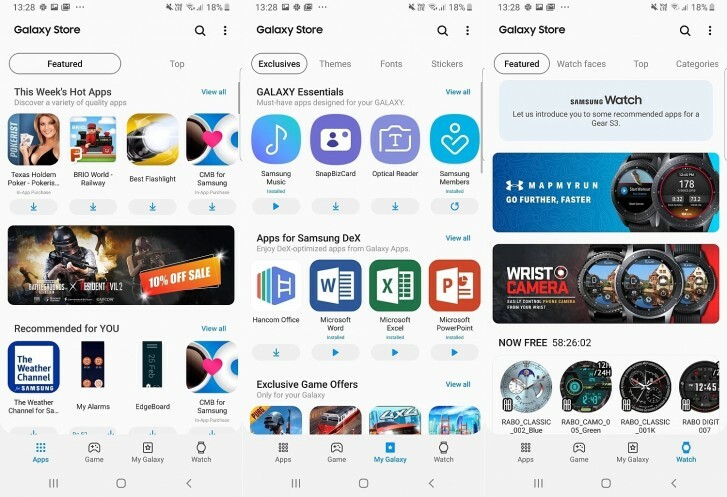 Galaxy Apps is rebranded to Galaxy Store with version 4.5.01.7 of the app, and is reportedly rolling out to Samsung smartphones running Android Pie. Got the update on my Samsung s8+ running oreo. Who need it? Play store is enough.